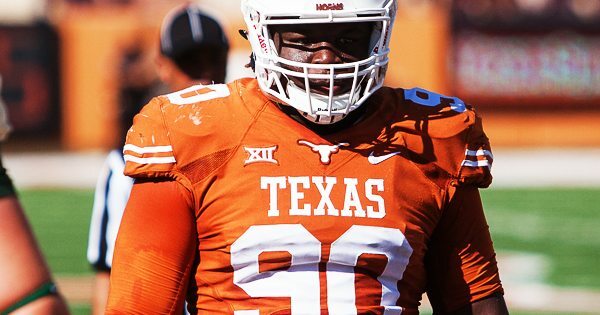 Austin -- Texas junior DT Malcom Brown, a consensus first-team All-American and finalist for the Nagurski and Outland trophies in 2014, has elected to forego his senior season and enter the 2015 NFL Draft, he announced on Thursday. "Coach (Chris) Rumph talked to me right after the (Texas Bowl), and I talked to my wife about it," Brown said. "Then I went and saw Coach (Charlie) Strong yesterday, and we had a good talk about it. I decided to enter the 2015 Draft, and that's what everyone thinks is best. "It wasn't an easy decision because a lot went into it. My wife has school, I have school, and moving the kids around. I got everyone's input on it, but at the end of the day, it's my decision and that's what I came to." This season, Brown became the 47th player in UT history to earn consensus first-team All-America honors. He was also a finalist for both the Nagurski Trophy, honoring the nation's top defensive player, and the Outland Trophy, honoring the nation's top interior lineman. "Malcom had an unbelievable season and was a lot of fun to coach," Strong said. "He's a tremendous football player and a great young man who has a really bright future ahead of him. I know the decision was a difficult one, but we had some really good talks. He has our support and we wish him the best as he prepares for the NFL." Brown was the sixth defensive tackle in UT history to claim consensus first team All-America, joining Rodrique Wright (2005), Casey Hampton (2000), Tony Degrate (1984), Kenneth Sims (1980-81) and Brad Shearer (1977). He received first-team accolades from the Football Writers Association of America, the Associated Press and Sporting News en route to being named consensus. "I'm going to miss everybody here, that's the hardest part about leaving," Brown said. "I had great support from the fans and my teammates, and that's the great part of college football. "It's a great coaching staff. They're all fun to be around and have great enthusiasm. They're a great group of guys and always want to know about your personal life. They just want you to be a better man in life, period." A native of Brenham, Texas, Brown led the team in tackles for loss (15) and sacks (6.5), becoming the first defensive tackle to lead both categories in a season since Degrate in 1984. He also led the team in forced fumbles (2), and tied for the team lead in QB pressures (8), while recording 72 tackles. He helped the Longhorns rank 25th in the FBS in total yards allowed (348.5 per game), 11th in passing defense (184.2 ypg) and seventh in yards allowed per play (4.68). "I'm always going to come back here," Brown said. "This is a great place with good people. I'm leaving good friends behind and created good bonds with people over the time I've been here. I'm always going to bleed orange and I'm always going to support this program." For his career, Brown started all 26 games over the last two seasons and played in 39, amassing 165 tackles, 28.5 TFL, 8.5 sacks, 14 pressures, six passes batted down, two forced fumbles and two fumble recoveries.